I can remember exactly where I was when I decided that I had to have this, the first country rock album I ever bought. I was sitting in a pub in Bradford, drinking beer with three equally under-age schoolfriends! We were studying for our A-levels (a national school exam English children take at age 18) and on a geography field trip to Yorkshire. On this day, groups of us had been dropped from our coach at different points around the periphery of the city with instructions to record the changing land use as we walked to our rendezvous in the central business district. Since we were fairly smart kids, we realised that, if we could find a pub to serve us, we could have a convivial lunch and then ride into the city centre by bus, straight down the arterial road, noting the different zones as we went. And so, I first heard Emmylou Harris sing her achingly beautiful cover of Lennon and McCartney’s ‘Here, There and Everywhere’ on the jukebox of a dodgy Bradford pub – and was smitten by her voice so much that I’m still buying her music more than 35 years later! Having heard that one track, I had to search out this artist – and then had the bonus of finding out from the LP covers that Ms Harris was extraordinarily attractive too! In an era when country music meant women with big hair standing by their men she was HOT in a way that meant she had no problem crossing over to a rock audience of teenage boys! 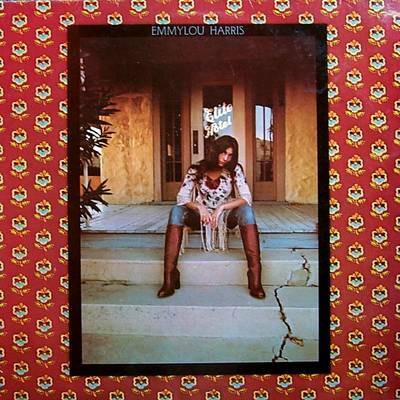 Elite Hotel, issued in 1975, was Emmylou’s second ‘proper’ solo album (third overall if you count a very early effort) following two further albums with the late Gram Parsons – and it oozes class and quality. Prominent among the backing musicians are the great James Burton on guitar, Glen D. Hardin on piano with Bill Payne, Hank DeVito and Emory Gordy also in the mix. Along with a young Rodney Crowell, both Bernie Leadon (lately of the Eagles) and Linda Ronstadt – both of whom were better known than Emmylou at the time – added backing vocals. The songs are well chosen. Ms Harris tips her hat to Gram Parsons by recording the Flying Burrito Brothers’ ‘Sin City’ and ‘Ooh Las Vegas’, pays her Country dues by covering Hank Williams (‘Jambalaya’) and Buck Owen (‘Together Again’) and gives a career boost to Rodney Crowell (her co-writer on ‘Amarillo’ and sole credit on ‘Till I Gain Control Again’). My CD version of the album, bought just a couple of years ago, is on WEA/Reprise/Rhino (8122-78109-2) and is tastefully remastered, with a couple of bonus tracks ‘You’re running Wild’ and ‘Cajun Born’) plus sleeve notes and lyrics which is more than the original issue which just had personnel listings for each track. Neil Young’s ‘Harvest’ was one of the first dozen LPs I ever bought, on the Reprise label, way back in 1972. This was pretty much on the strength of the single ‘Heart of Gold‘ which was a top 10 hit in the UK and also the reputation of Crosby, Stills, Nash and Young’s ‘Deja Vu‘ album which someone lent me. And probably also the fact that James Taylor and Linda Ronstadt were backing vocalists. I re-purchased it on CD last year as part of a good value boxed set of Mr Young’s first four solo albums (9362-494975 Reprise). Between those times its drifted in and out of the soundtrack of my life. Although it sold strongly it’s not an album I warm to – and I find it less satisfying than its predecessor, ‘After the Gold Rush’ . While the ten songs are OK or better it doesn’t really hang together as a collection. There’s one poignant live track (‘The Needle and the Damage Done’) which is just Mr Young and and an acoustic guitar; then there are two with the entire London Symphony Orchestra (‘A Man Needs A Maid’ and ‘There’s a World’) which don’t work for me. The studio tracks are the strongest though: as well as the hit single and the title track my favourites are ‘Are Your Ready For The Country?’ and ‘Alabama’ (which of course, along with ‘Southern Man’, prompted Lynrd Skynrd’s ‘Sweet Home Alabama’). Since ‘Harvest’ I’ve dipped into and out of Neil Young’s music in a fairly random fashion (the next thing I bought by him was a Buffalo Springfield collection from the start of his career). Sometimes he’s awesome (especially the guitar work on tracks such as ‘Like a Hurricane’ and ‘Cortez the Killer’) and the best of this album is in the same league.